Summer is no time to stay in your house and zone out in front of the TV. You should be getting out there, enjoying the beautiful weather, and expanding your mind with life-changing experiences! Whether you're an outdoor person or not Ohio has some summer fun lined up for you! Here are the 10 best summer activities in Ohio! The Columbus Zoo and Aquarium is an absolute summer essential, whether you're four or 44. See wildlife both land-based and aquatic, and even experience a genuine African safari at The Wilds! It's the perfect educational outing for families of all ages. Is there any greater American pastime than a good old game of baseball? The Cincinnati Reds are always up for a great game for affordable prices at the Great American Ballpark. So grab a cold beer or a soda to wash down your peanuts and cracker jacks, and go support the team. Just because it's beach weather outside doesn't mean you can't enjoy the finer things in life inside. The Toledo Museum of Art is one of America's most renowned art museums and perhaps even better on a hot summer day, air-conditioned. Is a summer vacation ever really complete without a day full of rides on roller coasters? If you're going to treat yourself with an amusement park trip, then make it a trip to one of the best parks in America: Cedar Point! Hocking Hills is packed with fun things to do in the summer, and you're just not an Ohioan until you've been there. 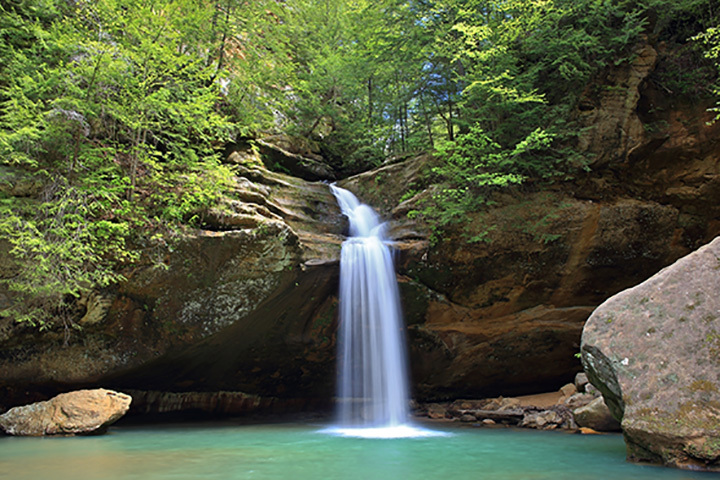 From canoeing to camping, swimming to hiking, or even exploring caves, Hocking Hills is one of the most fun summer spots in Ohio. When the days are unbearably hot outside, take a trip to an air-conditioned building and learn all about the music that changed the world and how it came to be. Featuring exhibits of Rock and Roll artists throughout history, this is an essential experience for any music lover. The Stan Hurt Hall and Gardens is one of the largest historical estate homes in the country, built sometime between 1911 and 1915. Take a tour of the 70 acres of land including the famous gardens and experience the English country-inspired design that gives the estate such class and beauty. Carillon Historical Park is a 65-acre park and museum featuring historic buildings, sculptures, and exhibits concerning the history of technology and Dayton from 1796 to present. It's a truly unique experience for those curious about Dayton's roots and how it contributed to the nation. Ghostly Manor Thrill Center is a great place to bring the kids and the family this summer for a day full of fun. With go-kart rides, mini-golf, a spooky haunted mansions, concessions, a skating rink, and a 3D theater, you'll want to come back every day! Voted a Top 100 Event in North America by the American Bus Association, the Amish Country Theater is a laugh-out-loud entertaining experience very time you visit. The shows at this 325-seat auditorium feature state-of-the-art lighting, sound, and stage equipment, and amazing performers designed to suit the whole family no matter how young or old.